Fill in the blanks with the best answers to awkward parenting situations and win this comedic card game. "Our perfect date night ended with an argument over..." might be best answered by "my unfinished baby book" if you're a parent. Or maybe "The logistics of planning a family holiday" wins? 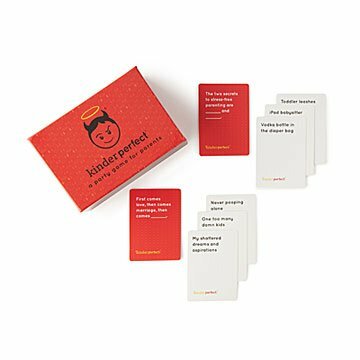 This rollicking game lets you compete with other moms and dads to see who can put down the most accurate—and hilarious—card. Play is similar to those classic pairing card games. (You know the ones, some are family-friendly, one is very not.) Take turns as "the parent" pulling a red card containing a fill-in-the-blank statement. (Say, "...is the best birth control.") As players put down their hands' greatest complementary card (here, let's go with "Expecting a smile and getting a face full of puke") laughs ensue. In the end, the player who picks up the most matches wins. But be honest, you're playing a game that doesn't involve the alphabet or cartoon characters. You've already won. Made in China. Absolutely hilarious. Recommending it to all my friends! !